Looking For Charleston Wedding Photographers How To Hire One…! Next let me honestly say first that there are some great wedding photographers in Charleston, SC and I respect their art and them being properly licensed. However, the reason I chose to put so much time and effort in doing this is to educate you first and to give you the client the option of reading this and you tell me if you think 320 wedding photographers are? My goal today with my proven extensive experience by owning King Street Photo Weddings and over the last 18 years, capturing over 500 weddings by being solely a wedding photographer in Charleston, SC (meaning that is the only thing I do), is to give you some incredible useful honest advice on you exploring your option for a wedding photographers in Charleston, SC on what I consider to be the most important information for you to know. 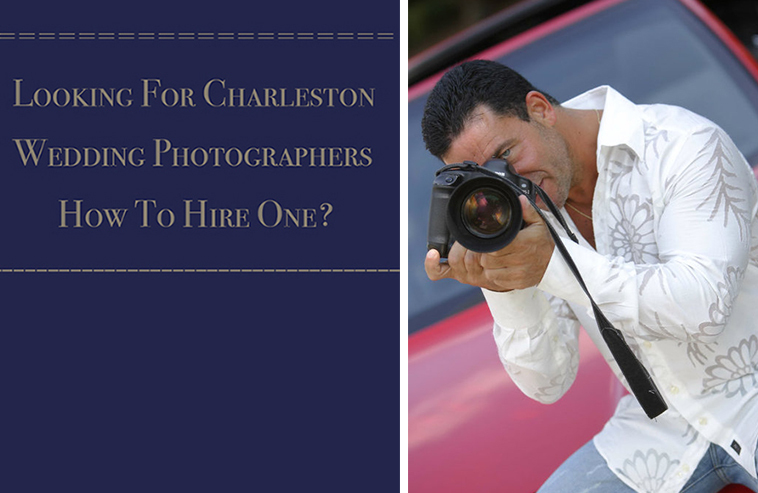 I have been asked numerous times for so many years from too many actual brides, mom, wedding coordinators and other vendors, to share this so informative information to make it much easier for you in choosing a Charleston, SC wedding photographer. If you read this entire informative post you will be saving many months and hours in your research for Charleston, SC wedding photographer. 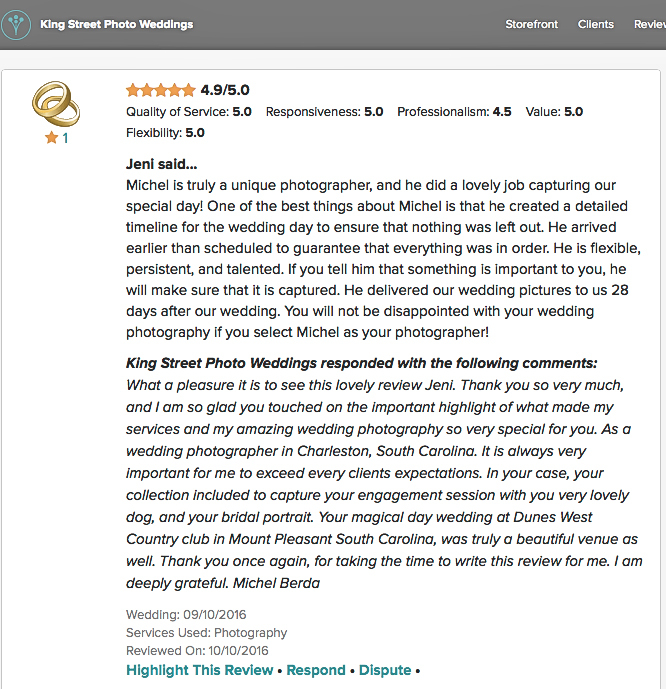 My sole purpose is to share what you as a potential wedding client would have never thought of asking any wedding photographers in Charleston, SC and until this is published you would have never known what to ask, except the same general questions. 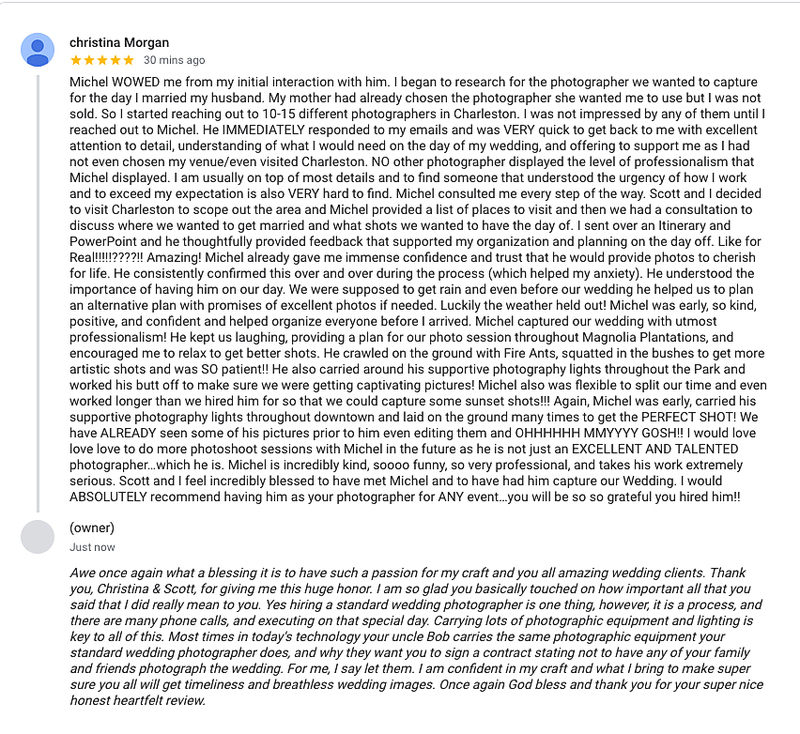 If you Google now ” How to choose a wedding photographer in Charleston”, you will come up with two or three blogs that photographers have posted about this topic. While I think they are good, they are are just covering the basics questions you already know how to ask. They are not even scratching the surface of what most wedding photographers hope you would never ask for. Yes, I said this, you may be shaking your head but let’s face the facts only someone with many decades of experience that is true in his words would share the behind the scene of real questions you should be asking for. So let me educate you on wedding photography and the proper business ethics, the questions you must ask. You probably will be like most grateful wedding clients I have communicated with in the past, that have sent me an email thanking me for putting so much time and effort to help you make the best & wisest decision on who will be documenting one of the most important days of your life. That is really all I want for you. Many wedding photographers would have you believe that if you simply fall in love with the wedding images they feature on their website, in their portfolio (that being a small percentage of an actual wedding in their gallery). That you would hire them. Well, I would say that works for 60% of you. This could be one of the biggest mistakes you make. Most of you would have never ever known why you should have made a bigger investment or have had better wedding photos because the fact is when you get your wedding photos back if you can see them your happy. Think about the logic in this scenario, you do not have another wedding photographer there capturing the same exact wedding and coming out with entirely different wedding photos. The first huge topic before the tips below is this questions. Are you choosing a digital, or film photographer or both? Why is this of any importance? Well, both can have some drawbacks such as in digital more about the memory cards and if they are not upgraded or checked or malfunctions you may end up with a defective card or cards, and lost of wedding photos and this could be a huge problem (I call it the end of the world). However, If you hire a true wedding professional photographer you can minimize all of these issues by her or him knowing the right steps on how not to have any of those huge issues. 99% of the times the beauty of digital camera is that you can record the exact same images if you have the real professional digital cameras that record simultaneously on two cards. (yes backup. I live for backup, my clients deserve back up). If you are strictly hiring a film shooter well make very sure they also capture it via digital cameras, for so many reasons, I have over 36 years of film photography & developing film experience (what is called C41 processing). In film photography even if you are a professional photographer, If you do not load the film correctly (you can notice that when you are winding up the film when you think you loaded it correctly) or if your shutter on your camera goes bad, 99% of the times you never know that until that film is developed. Flash photography, if you do not have the right flash sync speed, that can also be a total nightmare (imagine your flash photo looking like this, a black shutter mark and some of the film exposed depending on where your shutter blades are at that time. Yea not good). (some wedding photographers reading this will argue that this could happen with a digital camera. I will conquer, but not after the film is developed, more like instantly) Yes, that photographer could check that shutter that is either in the lens or camera before putting the film in however once the film is in well your hoping all is well. Cameras are usually well built so are the shutters, however, I rather have a digital camera tell me immediately that something is really gone wrong. (yea they do that) and another good reason for your said wedding photographer to carry a minimum of 2 cameras at all times. (remember the moment is instant). Also is that photographer really knowledgeable about photography to set the camera properly with the type of ISO and film they choose? Remember no screen, no picture to see until the film is developed. Last and most important have you ever, ever considered what that said photographer does to get that film processed? Generally 120 or 220 films, well here I go again using percentages 98% send that film to get developed. Photo labs are almost instinct and there are very few that specialize in this, generally not where your wedding photographer lives. So if they did not record the exact wedding images on digital they have no backup. Now sending the film through the mail and various carrier and again getting those films back well that is, after all, taking a chance. First, it has got to get there and if that lab does not scan the film before they send it back, again all the trust of the most important day of your life is in the hands of that lab and various carriers. Again not trying to scare you but these are facts. The lesson is making sure they capture your wedding on both. However, that could be a whole another great topic and post, you cannot use two cameras and record the exact same thing at once. Well maybe if you have a second shooter, but technically not exact and who has the real wedding photography experience? Have you ever seen or imagine two wedding photographers capturing the exact same thing, at the same place using the exact same cameras and lenses? These leads me to my #1 tip. Tip #1 question that 80% of brides fail to ask for is. Yes, your goal is to see (2) completed edited weddings. This is what you want to see and look for. First how those weddings were captured from the beginning to the end. From the pre photos to the first look if you are doing one? The ceremony, to the reception photos. This would include, the total amount of photos, really quantity means nothing versus quality. The quality of the wedding images is what you want to see. The way that wedding photographer has either edited the wedding photos if they do that or here is the real secret and many of you are going to shake your head when I say this, some outsource that to other companies. Really? Did you know this? Is there a good or bad in either situation? Not really, however, why would you not put the art you have into editing when you put the art into capturing them? Next, you want to see if the wedding images are perfectly edited and if that wedding photographer is a true professional? Here are some great key points you want to look for. How great is the quality in the images from the pre photos with the groom and the groomsmen and for the bride and bridesmaids, including the family, look closely are there any variation? (remember now you are looking at two or three various weddings photographers actual completed posted weddings, you must see a huge difference between them?) How about the details photos are they that exceptional or like most basic? Are you seeing the past client wedding documented as a sporting event where you see the same photo in a few seconds apart? Do you find yourself asking do I really need to see 5 very similar wedding images like this or one good one? (that is a huge indication of poor editing and the photographer hoping to capture so many that one will turn out good). Are you seeing the same family photos more than once? Are your ceremony photos all captured from the same place when the wedding photographer was given free access to move anywhere to capture the best ceremony images? Does the wedding images you are seeing somewhat mimic the website photos you fell in love with? Wait there is more. Next is it well-documented in a very storytelling compelling way and in chronological order and if it is, correctly and properly edited? Are both the color space and the sunset, reception photos consistent with soft balance strobe lighting? Let me explain. Generally speaking, every couple wants, amazing sunset photos, you must also have vibrant reception photos. What do these look like? This is where you will see if that wedding photographer has a huge talent in lighting. Are they bringing the right lighting equipment or just a strobe and you see results like this? Many of the wedding reception photos with a black background, (why is the background not match to be properly exposed) and or washed out images (overexposed), are they not using a diffuser on that flash? Are they not able to bounce the light that often time can be softened the light by using this technique of bouncing the light on the ceilings? Or maybe no ceilings? Are the ceilings too high, or maybe very bad math in lighting ratios if they are using the flash on manual? Are they using their flash on TTL (through the lens metering system) where the reception photos lighting are all over the place? Is this true when you are seeing all of the reception photos? Do they have either too much light or not enough? Or are they simply dialing the ISO (the sensitivity of the image sensor) so high that you are looking at super grainy photos? When you look at these indoor reception images why are the bulk of them so orange? Is your actual factual skin tone really that way? This is what us professional call (bad color profiles). Do you also see many of the reception photos that are both grainy and turned into what they call B&W because the color balance is so off, what I call bad contrast and poor greyscale, super pixilated, not true B&W? All of these are factors. The benefit of seeing two or three different wedding photographers full edited posted recent weddings is that yes, you now will have a much clearer vision on the behind the scene and know exactly what you can expect back on how your wedding photos will look like from the one you choose to be the real professional wedding photographer. Not just website photos or portfolio photos. Last and so important for getting your wedding photos, via either download or thumb drive or both or none? If your wedding photographer has agreed to give you all of the wedding images via verbal agreement, make very sure that it is on the contract that you are actually getting the wedding images via a download or a thumb drive or both? The second question for you to ask her or him is, what is your turn-around time that I can expect for seeing my entire wedding photos? (so very important who wants to wait) Make very sure that what they say in the language is in printed and on the contract (again a true professional should give you an expectancy of 3 to 6 weeks maximum). 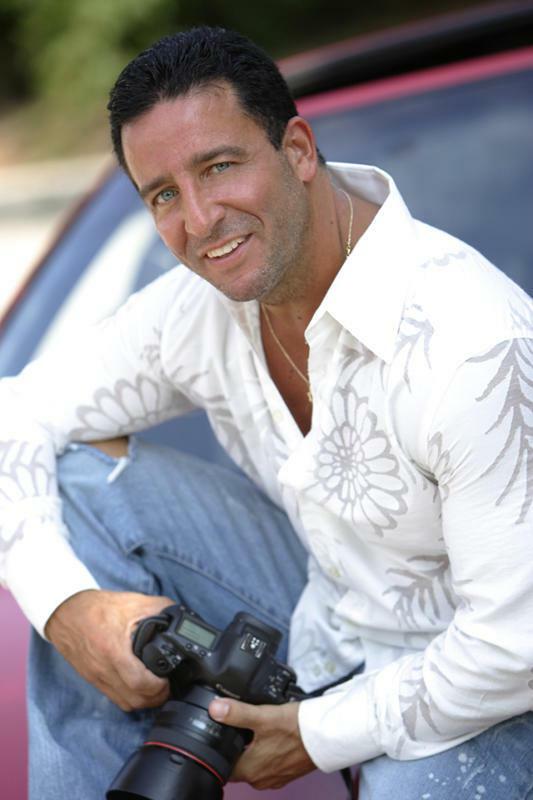 Most honest and professional photographer will have that language and time in their original contract. Next assuming you are getting your wedding images and you should, for the huge amount of investment your making. However, if that photographer only offers you the capabilities to download the images without providing you with a thumb drive, and even when today’s technology is so great, you may not receive high res images and if you do, can you imagine the amount of time it would take for you to download 64Gb depending on your internet speed? Bottom line is you want a thumb drive that will also include high res images for that reason and this, again backup. Next question is what size is the thumb drive? How many photos are you getting on for an average 8-hours wedding coverage? When you get the thumb drive (if you do not get high res photos) why is it that you can only print photos in a certain small size? Why do you have to ask for or pay for larger files or is it that your photographer will not give that to you but sell you the larger files, or instead ask you to pay a huge amount of money for a large canvas print, because they want to hold on to the larger file size (to make even more money)? Let me make this very simple for you. If you get many no to these questions asked, please move on to another wedding photographer. Now that you have read this first so important #1 tip that I have spent so much time putting together and that you have spent so much time reading, this will make you go back to what you had originally set in your mind and thought on about how you were going to sign on the dotted line and hire that so-called professional wedding photographer. Only if by now you have viewed two or three different wedding photographers with at least two weddings each, they posted and provided you with the links. Wich one of those photographers do you love the results from? This simple question will change your mind drastically. Imagine this information, and If you had never read this and asked for these questions you would have never known. 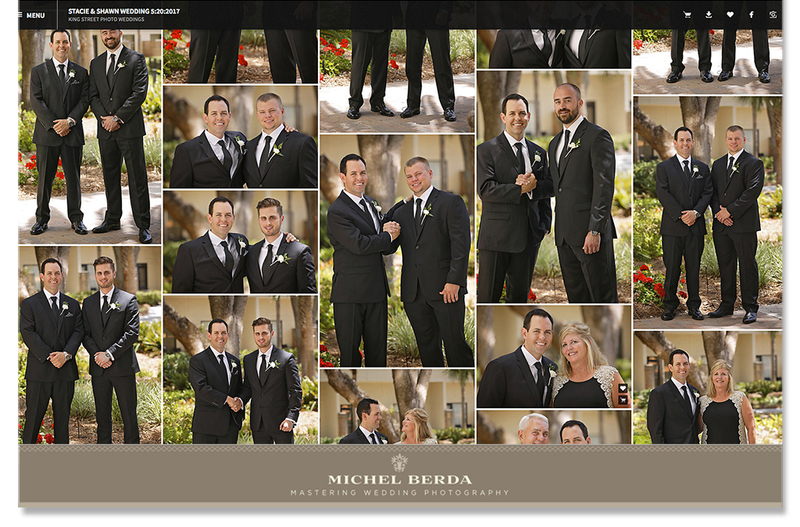 My point made to make very sure you are getting amazing well-edited and captured wedding images. Again you are investing lots of time and money and deserve just that on your day that is only one day. Nothing better than peace of mind and knowing what you will be getting and definitely can expect. You see for me, I always wished for my clients to have asked these so very informative important questions. Because simply, I do my own editing generally 20 to 30 hours, and for every wedding, I put them in chronological order in a very storytelling way and color balance them correctly and properly. I post everything on Pass, supply every client with all of the wedding images, and they generally receive a 64Gb thumb drive (not a misprint) including on that thumb drive are two folders a JPEG and TIFF folders, most files are from 6.4MB 15.5 MB JPEG. The Tiff files are from 33.1 MB 66.5 MB Huge files and you also get a shared printing right letter (meaning whether you upload the wedding images or bring them to the local photo lab, they will need to see this letter in order for them to print). For the wedding day and has to the equipment, I carry 3 to 4 cameras on me all day long with various real professional lenses, and I bring major lighting, softboxes, and monolights to every wedding and wait, I even bring backup equipment because guess what? You can never ever go wrong with more than less. From the various surveys I have studied including Google, many of you live such a busy life that often times, you are shopping for a wedding vendor from your work. That is totally okay, (well maybe not lol) by you just simply filling out an email with the basic inquiry to that said wedding photographer. That is a great way to get the ball rolling. However, upon getting those replies back, if they have responded back? Supposedly the so-called proper etiquette in answering those inquiry request is within a 4 hours window. I have no idea who came up with that theory? I, however, choose to disagree. I am convinced that with today’s technology and the fact that we check our PDA many times daily. The surveys for that I have seen ranges from various ages, most of the survey can all agree on a base of 74 to 80 times a day that we look at our PDA. WOW….! Let me see now, if you are checking your phones that many times a day, and you run a business any business, should you not be proactive like me and reply within minutes and if you are busy maybe within the hour (agreed not on a wedding day)? Still, all of this shows you that this is the experience and service you will have from that said wedding photographer for almost an entire year. Here is my suggestion, narrow down the selected few wedding photographers you have chosen. Again after Tip #1 & #2. Next, and this is so important to see if you are a perfect fit? Set up a phone conference or a live chat, this will make such a huge impact on your final decision. I would say this plays into 50% of your decision, look at the facts here. You are going to speak to that wedding photographer and plan this day plus you are spending your entire special wedding day with them. Do you think communication has any part of this? Yes. Pick up the phone or meet in person and make very sure that photographer listens first and gets your vision and your needs for your day. This will give you a huge amount of peace of mind. Remember this you are always the client this is your wedding …! 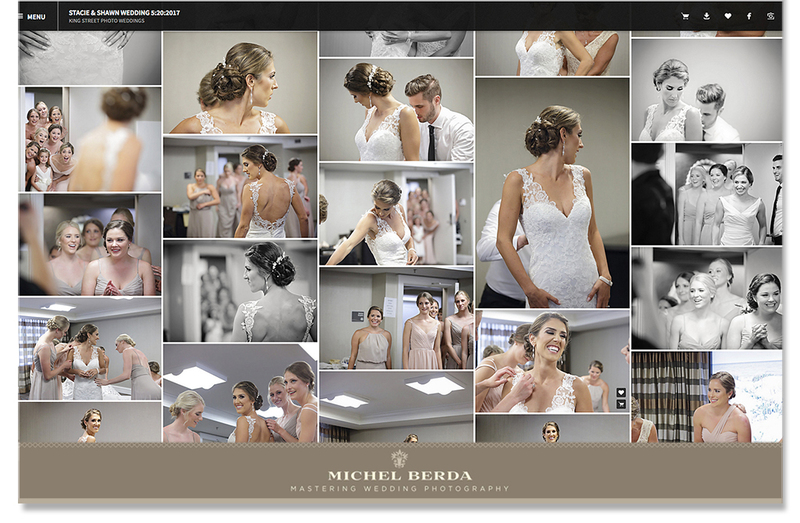 Tip #3 How experienced and detailed is that said wedding photographers timeline? Your wedding day needs to be the most enjoyable loveable day of your life. The process must be seamless. In order for it to be that way, you must have the most perfect wedding day timeline. While you are thinking well, my wedding coordinator can take care of that, I am here to tell you that your wedding coordinator may be the best, however, she would have wished you would have hired a wedding photographer that would have gotten all that done for you and then she could incorporate that into one master timeline. Again this is a task and process a wedding photographer has to be able to assist you both with (your fiance included) by having a meeting or a phone conference. This process will be great for you both to give her or him (photographer) your vision and for them to share their experience of the best way to have the most enjoyable seamless wedding day that is perfectly captured. Again this is another way while you are thinking about who is going to be the best wedding photographer for you to ask and receive two or three selected photographer to provide to you the actual past wedding timelines they have done for their past recent wedding clients. 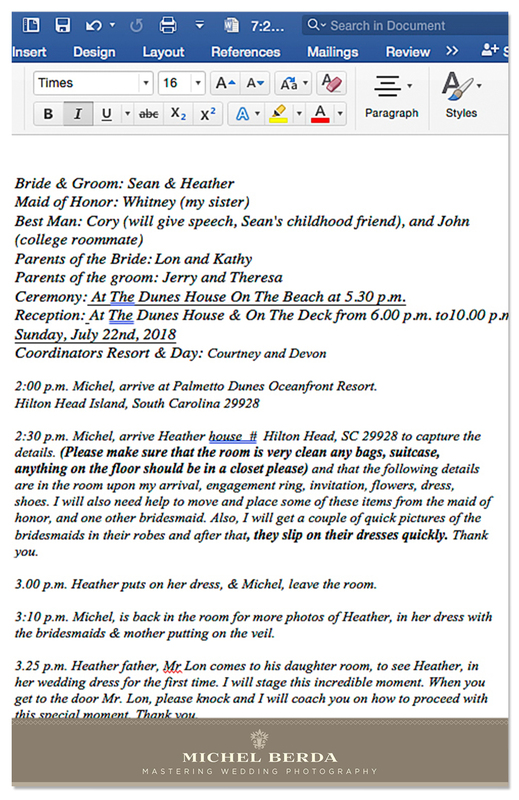 Again you will now see another part of who is best at implementing this and creating the perfect wedding day timeline. Tip #4 Are you hiring a licensed Insured business or a weekend warrior or someone who does not want to purchase a license? Question for them; Can you provide to me, the State of SC license and a license for the proper municipality in Charleston, and for the church or synagogue or venue the proper liability insurance they require (they may want both)? 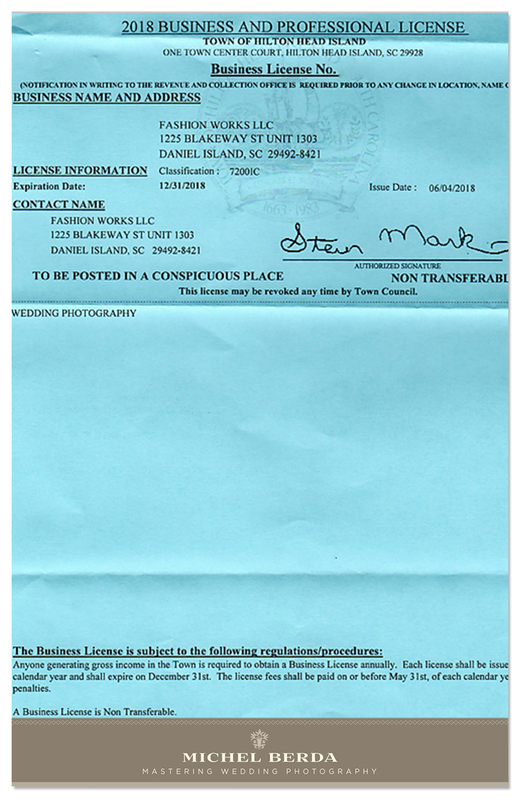 Most of you think because a wedding photographer has a website and call themselves a wedding professional photographer, that they, in fact, run a legitimate business in being licensed properly with the State Of South Carolina. 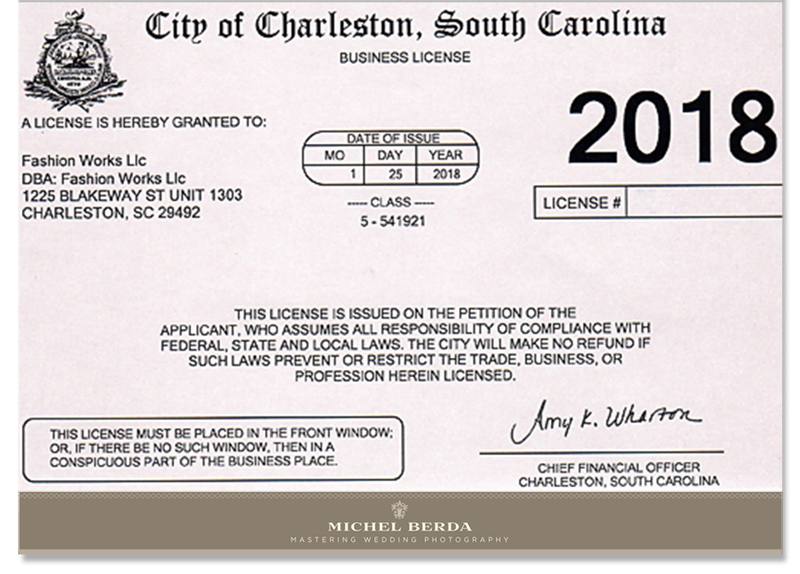 (I beg to differ) Also one of the most not know fact (by clients only) is that in Charleston, SC that any and all or most wedding photographer and any and all wedding vendors doing business in any of the different municipalities are required to have all of these(4) various different businesses licenses. Quote” every person engaged or intending to engage in any calling, business, occupation or profession” If one realizes any income from a business activity that a person is required to purchase a license. Yes, you need these business licenses in order to do business in these different municipalities. There is one for The City Of Charleston, one for Town of Isle Of Palms, One For The Town Of Mount Pleasant, & one for Sullivan Island. Btw Sullivan island, in my opinion, is one of the best in enforcing their ordinances out of all of them. Because they actually do that. 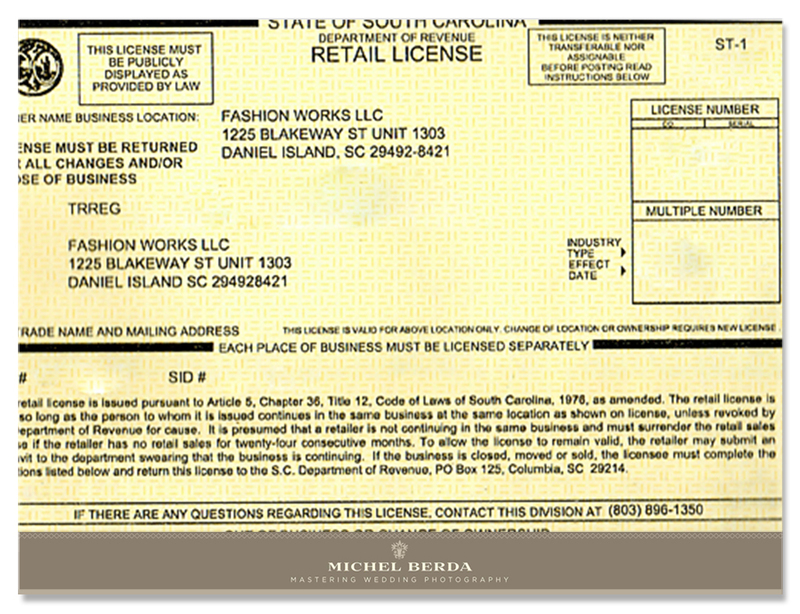 For me, because it was the right thing to do ethically and for the business, I also have a business license from The Town Of Hilton Head, SC. Does this matter to you? I hope it does and that you believe that all wedding photographers need to be properly licensed. Now there may be another huge issue. Some churches, synagogues & venues & for the coordinators that dot their i’s and cross there t’s that I praise for doing this (not all ) are going to require that the wedding photographer you choose to provide a certificate of liability insurance & maybe business license. In my research with most legitimate liability insurance is that you have to be an actual business and properly licensed in order for them to issue you biding liability insurance. Again if you did not read this and hired one and now are going wait I did not know this and she or he never mentioned it. Well, panic. Because I cover this important topic with all of my inquiry and in answering the inquiry, I send them a scanned copy of the business license for the proper town or city and I also provide to them a copy of the last liability insurance certificate I provided to the venue and client. Again every wedding client deserves peace of mind. Back in the days, you use to ask for referrals make a few phone calls when you were about to hire a business. In today worlds prospective wedding clients check Google, Wedding Wire, The Knot, and many other various wedding companies to see the credibility of that said wedding vendor. Here is where I think most of you make another huge mistake. You check one of those above and you see a few reviews and your like wow every vendor has good reviews. WRONG. To make it easier for you, just take all of the 3 companies above and come up with a grand total. That total of all 3, is the key in you making another good decision on who has the most reviews that are 5 stars. Google makes this simple for you and so very easy when you Google that photographers name or company it is usually under reviews from the web. Mine is 221 as of today. Yes, that is huge and I am so very proud of having these lovely honest reviews. I have poured my heart and soul for 18 years doing the best I can for every single wedding clients that I have had the honor & privilege of capturing their weddings. I have spent the entire week, many hours back and forth tweaking this for you all. 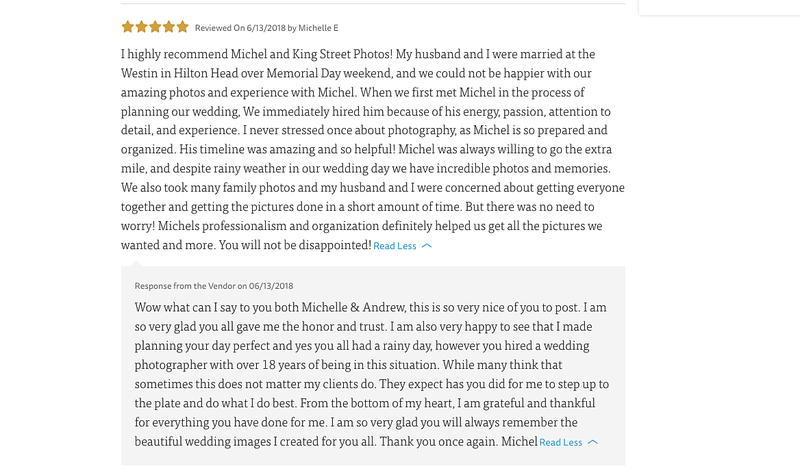 I thank you for the privilege of your time to read this so informative information about how to hire the proper licensed insured wedding photographers In Charleston, SC. I want the very best for you because, in my eyes and heart, every wedding client is unique and different, this is after all one of the most celebrated happy events of your life. I want every one of you to be very educated and make the best decision. I leave you with this quote. May you have the most amazing wedding and that it is in fact captured perfectly…!